Archive material relating the the history of antique dealing in Britain continues to come to the University of Leeds – this time whilst it may be only a very small amount of photographic material, (some 40 black and white photographs relating to the London based antique dealer ‘Ropley’), it is nonetheless a fascinating set of photographs that provide further insights into the cultural history of the antique trade; they also complement the extensive photographic archive material in the Phillips of Hitchin, M. Turpin and Roger Warner archives already at the Brotherton Library Special Collections at University of Leeds. At present we don’t know that much about the dealer ‘Ropley’ but in the 1920s they were trading at 35 Duke Street, Manchester Square, and at 19 Mount Street, London (see www.antiquetrade.leeds.ac.uk). Here’s an old advertisement by Ropley, undated, but probably from c.1920? ‘Antique incised lacquer cabinet’, Ropley Antique Dealers, c.1920. Just like Phillips of Hitchin, and many other antique dealers during the opening decades of the twentieth century, Ropley sold a wide range of antiques and also supplied fabrics – Phillips of Hitchin, for example, as earlier posts on the antique dealers blog have indicated, produced and supplied reproductions of historic textiles (see blog posts for July and August 2017). The set of Ropley photographs date from the period c.1910-1920, and were taken by the firm of Sydney Newbery, of Brixton; many of the photographs have pencil annotations on the back, with several marked ‘Ropley’ in pen in the top left and right-hand corners. 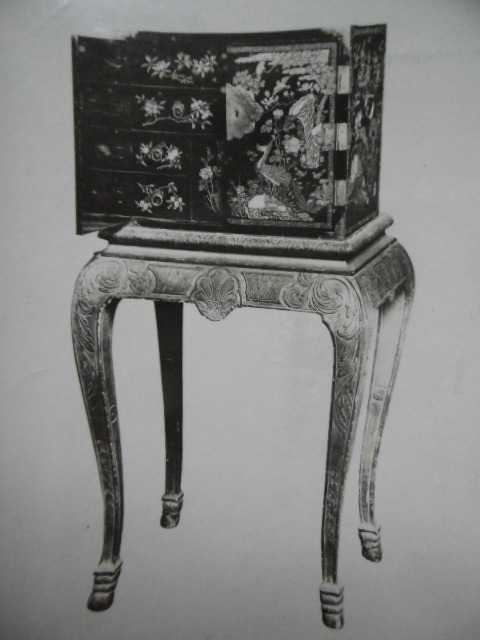 This photograph of a Chinese lacquer cabinet on stand is annotated on the back ‘Antique incised lacquer cabinet on gilt stand; height with stand 4ft 1in, width 2ft 1in’, and is inscribed ‘Ropley’ in the top left-hand corner of the back of the photograph. 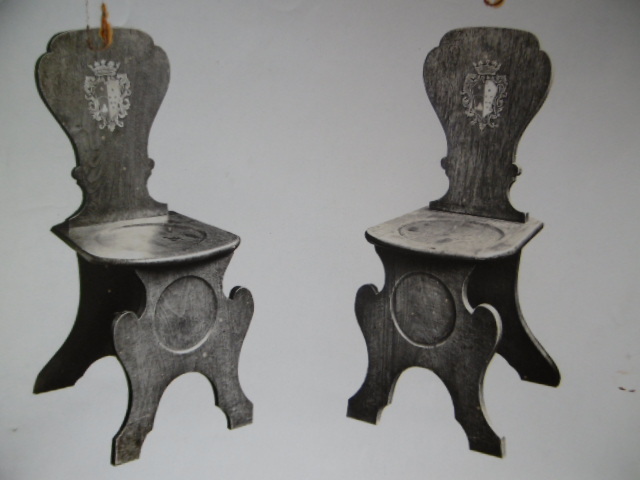 And the pair of eighteenth-century hall chairs, shown in the next photograph, are described on the back of the photograph as ‘Pair of antique Queen Anne mahogany hall chairs with decorated coat of arms in the backs. Over 100 years old. 3ft 1in x 1ft 2in.’ They were available for the price of 13 guineas at the time (one guinea was equal to 1 pound plus 1 shilling; 1 pound contained 20 shillings). 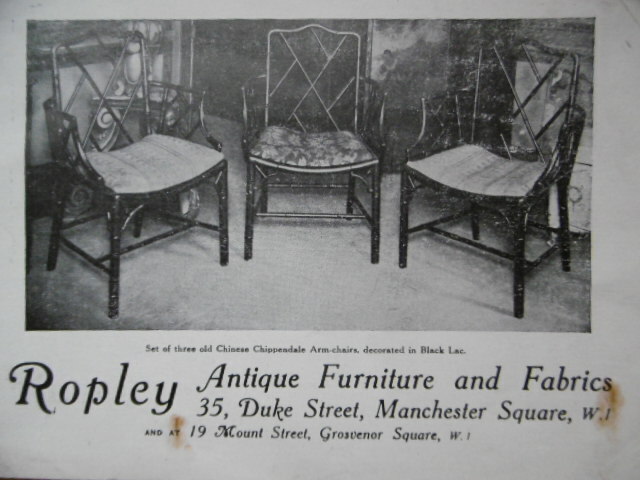 ‘Pair of Antique Hall Chairs’, Ropley Antique Dealers, c.1920. We now know of course that the hall chairs do not date from the period of ‘Queen Anne’ (i.e. the opening decades of the eighteenth century), but perhaps we can excuse Ropley in their error. 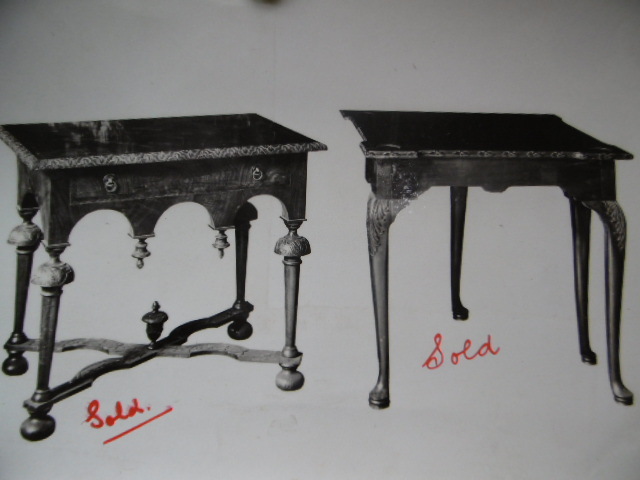 Other photographs in the small amount of Ropley material illustrate the range of ‘antiques’ that a dealer such as Ropley sold in the period; including (left), ‘a pair of pole screens with wood panels on dull green ground..£19 the pair.’ together with an ‘Antique Mahogany Workbox on stand…£21 10 Shillings.’ And (right) a selection of eighteenth-century torcheres (there are no annotations are on the back of the photograph of the torcheres, other than what appear to be stock numbers of the objects – it would be fantastic if the Ropley stock books still existed). ‘Pole Screens and Workbox’, Ropley Antiques, c.1920. 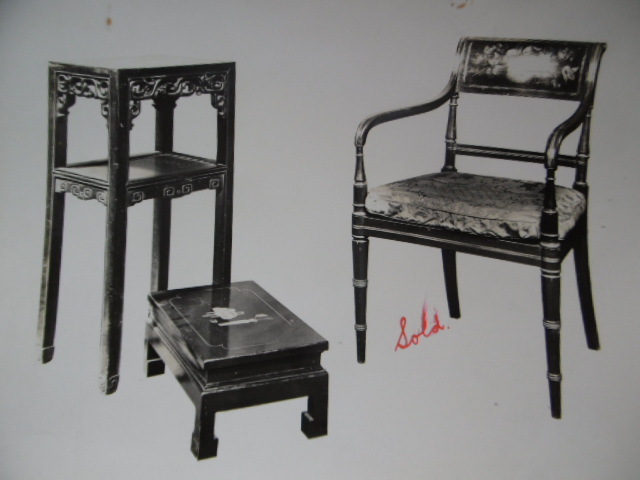 ‘Chippendale’ furniture was one of the most desirable antique furniture during the 1920s (as it is today of course), and the photographs from Ropley also include examples of the ‘Chinese Chippendale’ furniture, which was extremely popular at the time. ‘Chippendale fret table’, Ropley Antiques, c.1920. ‘Antique Mahogany Chippendale side table..’ Ropley Antiques, c.1920. 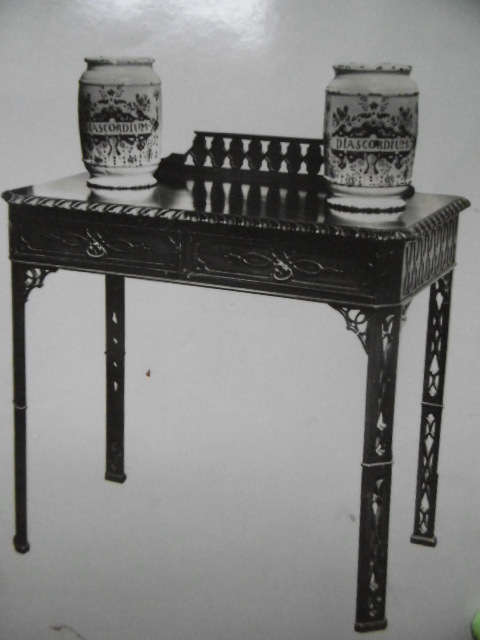 The ‘Chippendale fret table’ is annotated on the back of the photograph, ‘A Fine Old Chippendale fret table, 3ft 7 and a half inches long, 19 and a half inches wide, 24 inches high’ and was priced at £50.10 shillings – quite a price at the time. Verso of the ‘Chippendale fret table’ photograph. Ropley Antiques, c.1920. 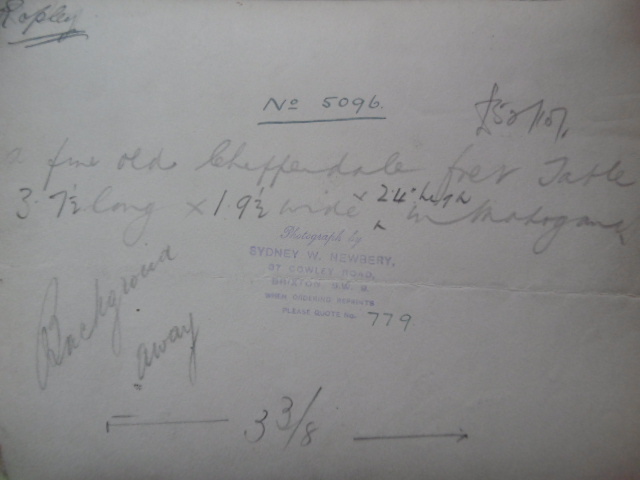 Other annotations on the back of the photographs indicate that they were to be used in advertisements by Ropley – the pencil inscriptions suggest the size of the image in the advert (3 and 3 eighths inches wide) and have instructions to the publisher to edit the image ‘Background Away’. 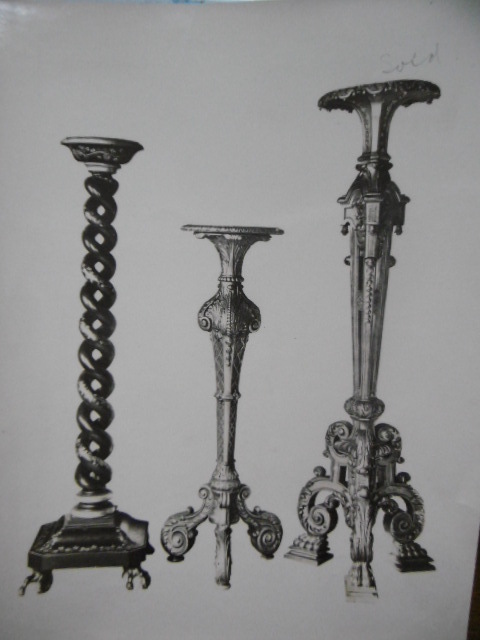 Stock of Antique Furniture from Ropley Antiques, c.1920. 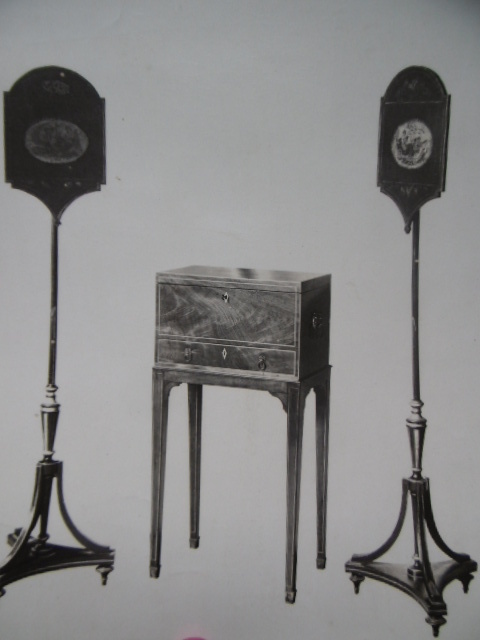 And the tables in the photograph below, had been sold to ‘Miss Wood, Ontario, Canada’ – an indication of the significance of the transatlantic antiques trade in the period. 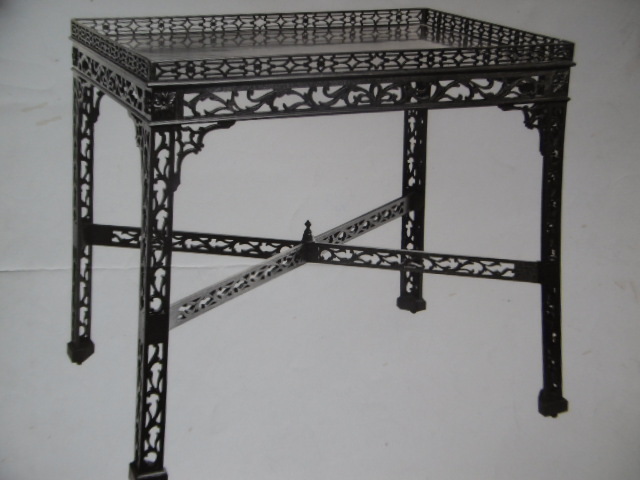 Antique tables, from Ropley Antiques, c.1920. This small archive of dealer photographs offer further fascinating insights into trade practices in the 1920s and will be a very useful resource in the continued study of the history of the antique trade in Britain.